There was no warm water in the morning and the cold shower went quick. I fled the filthy hotel, opened the car’s frozen doors, turned the engine on, started to pack and prepare breakfast and food for the day. 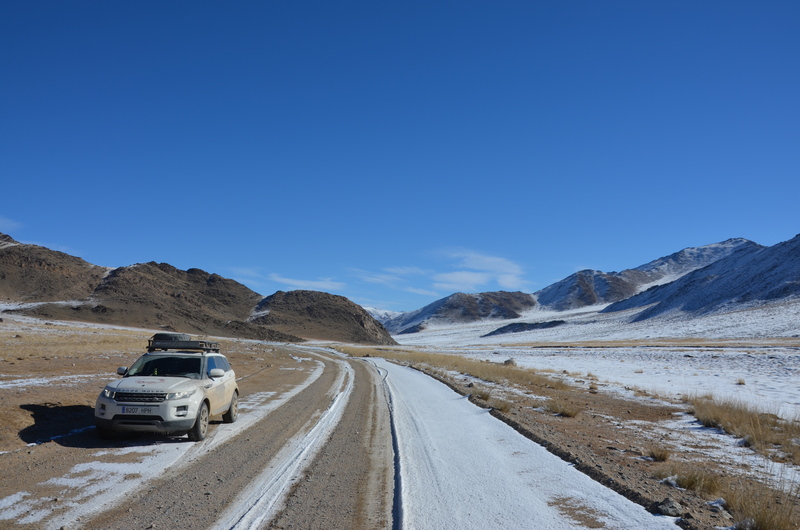 Slowly the Evoque and I warmed up, the kettle gave its first dose of hot water for a tasty Nescafé, and at 09:00 I left Khovd. Again, the road ended at the border of town and converted into dusty tracks that slowly ascended into the nearby mountain range. This morning I hadn’t fully waken up and drove slowly through the potholes, sipping coffee whenever possible. 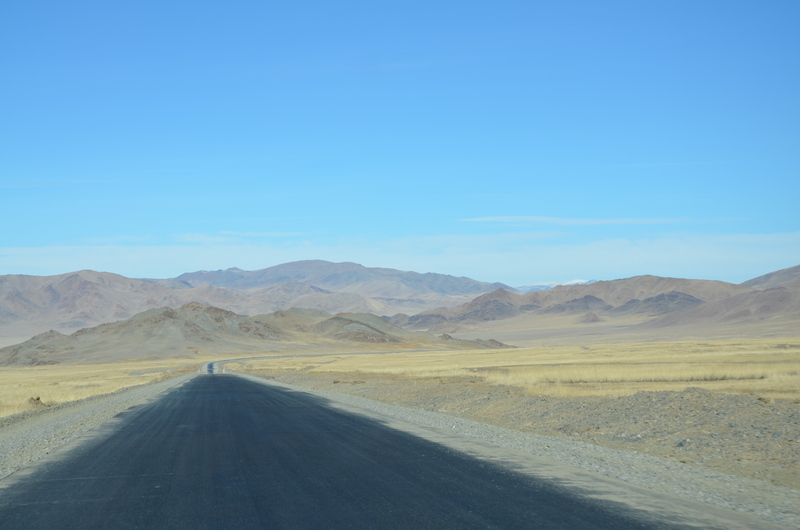 The sunlight warmed the inside of the car, and I admired the last bits of golden steppe before the road disappeared in hills and mountains. 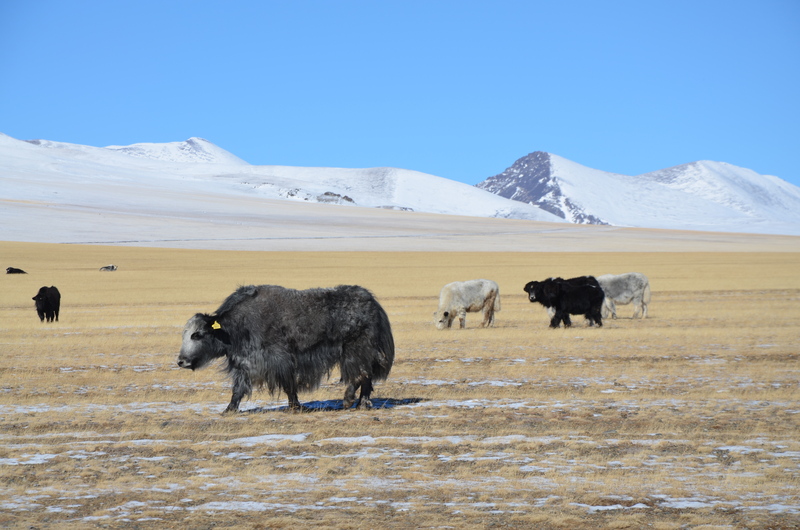 Several herds of Yaks passed, I had to cross two partially frozen water flows that looked scarier then they actually were because of the ice. The mud was also much less dangerous if frozen. I started to gain altitude, until reaching 2620m. As I descended again, the big, deep blue Lake Tolbo appeared, frozen on its fringes. I drove past it on a horrible stretch of stone littered track when a tarred road appeared. I was getting close to the next town apparently. 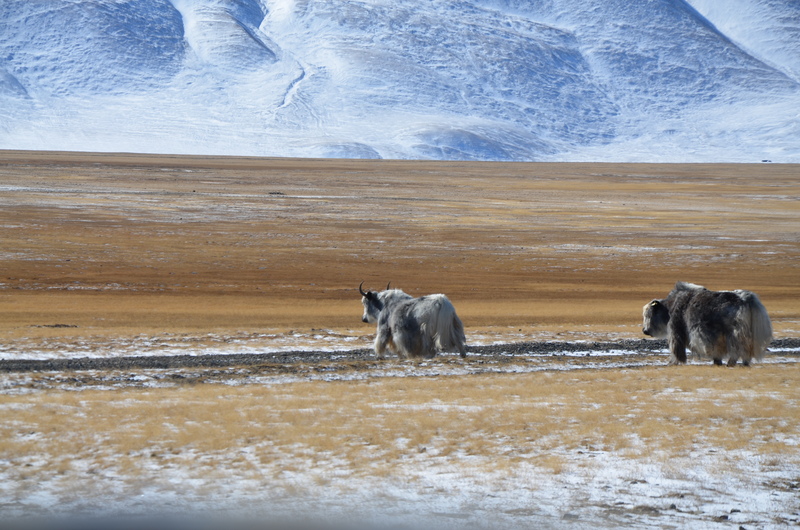 And indeed, at lunchtime I reached Ulgii, surrounded by snow capped mountain ranges. 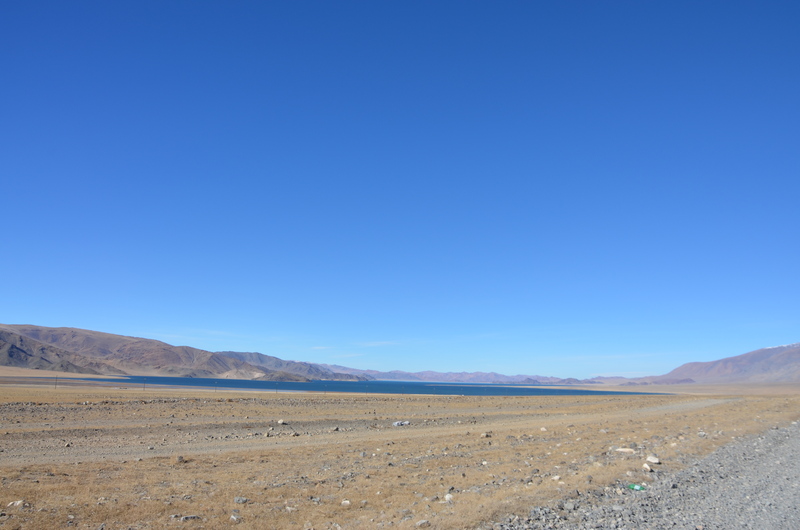 As I drove through it, I realised it was much cleaner then any previous Mongol town. People looked different, less Asian, more European. I passed two mosques, one on each entrance into town. And strangely, at the exit the road stayed tarred! I turned the music on and at full speed flew towards the next mountain range. I must say that this north western piece of Mongolia, not flat steppe but mountains, is one of the nicest places I’ve seen so far. At 14:30, after a mix of tar and dust, I reached the border with Russia. Mongolian controls were easy, in 30 mins I left their border station. 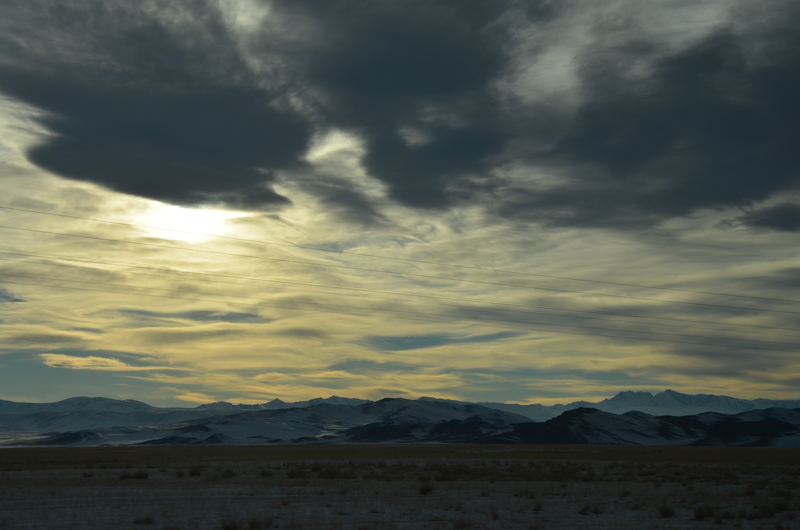 Goodbye Mongolia! It took a while to reach the first Russian passport checkpoint. From there it were another 20km to the border control, where I got all customs formalities done. A young official explained me several times how to fill the form in two copies, and at the third attempt I got it right, and he finished his stamping session. Through the gates of the customs control I almost rushed off full speed when I spotted a small sign “Immigration control 20m”. And indeed, a civilian guy in a hut on the side of the street collected m immigration form and kept one half of it. I fuelled up, and at 17:00 the drive into Russia started. I had been warned by the Swiss Landcruiser guys and by another Swiss guy I ran into at customs that the stretch of land would be very beautiful. It was much more then that! 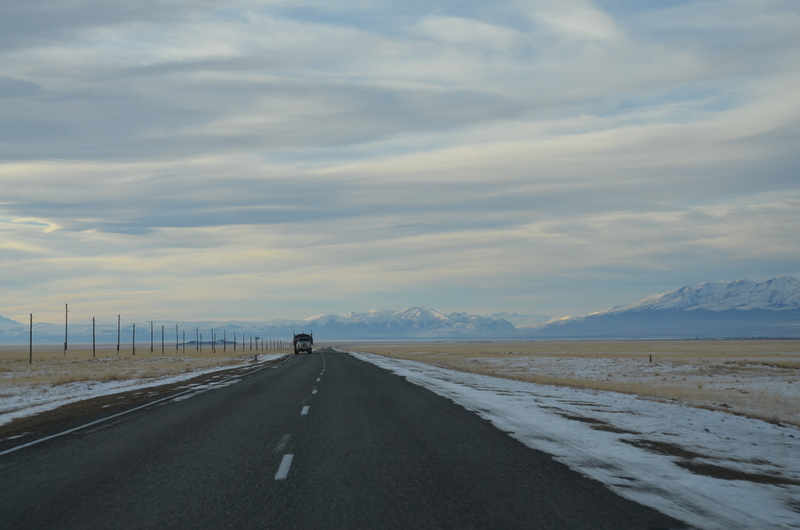 The first hour I drove through a snow covered stretch of steppe, white mountains on both sides. Little villages with wooden houses were all around, the low sun covered the whole scene with a magic light. Past the plain, the road led into the mountains, and somehow I felt like I was driving through the Alps. There were trees again, more and more, full forests at some point. Rivers curved through valleys, little frozen lakes passed here and there. The road was perfect, not just tarred but with roadsigns. I felt Europe was getting closer! As I kept driving through these beautiful alpine mountains, the Chuysky Trakt through the Altai mountains, the sun went down and it got dark. I dreamt about a wooden chalet on the side of the road, with a hot shower and warm meal. I looked for a place to stay for the night, but didn’t find anything. When in short sequence I almost drove into three sheep appearing on the middle of the road from the darkness and almost hit two dark brown cows crossing the street at snail speed, also them appearing right in front of me quite suddenly, I realised I had to stop. Driving at night was too dangerous, and also a pity because the landscape was so beautiful I wanted to see it in daylight. At a gas station I asked for a hotel, at the next village again. Three old Russian ladies sent me into town, and at a supermarket I got told there was a “gostiniza” across the street. For 700 RUB I got a room, with electric heating, and they also had showers they promised to be hot in the morning. I asked for food, the sushi they offered didn’t inspire too much confidence. “Russian food? Borsch? Solyanka?” “Njet!” I got an instant soup and a can of fish out of the car, plus a beer, and closed this day quickly, I was too tired.